i.Sound does it again. Their dreamGEAR and i.Sound audio products continue to impress MyMac for innovation, value, and best-in-class sound quality. This tiny speaker system for Gen2 shuffle iPod has a surprisingly rich sound. AudioDock is easy to use with USB computer power or 3-AAA batteries. For tethered listening and charging, or portable shuffle listening, this little wonder is a very good choice. 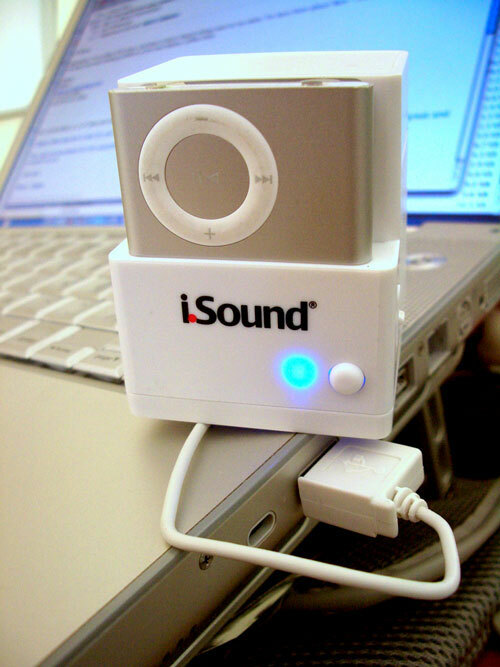 MyMac was reluctant to evaluate i.Sound’s AudioDock, because we didn’t want to spend time on a clunker. What a surprise — sound was richer than we ever expected. A handy printed manual is included, as is a toll-free USA phone number for tech support. Four colors are available for this product: blue, green, orange, or white. Pick a color to match your Gen2 shuffle, or your knapsack/purse, or bathroom/bedroom, or car/bicycle. Take two! They’re small. This is a “there is no step three” audio device: after inserting batteries or connecting to USB port, turn on AudioDock and start listening. That’s what I’m doing right now. Nicely done, i.Sound. XtremeMac has done an exceptional job with this multi-purpose charger+cable. Its dedicated web site has great photos and product descriptions. Other companies should learn from this example of customer info. The Incharge Auto is with me at all times in my car as a mobile iPod charger. Its detachable USB cable gets bonus points when I’m in need of an extra iPod charging cable while on my rounds as peripatetic computer tutor. With its $20 price tag and lifetime warranty, Incharge gets our highest 5 out of 5 MyMac rating. Skullcandy’s Pipe speaker is stylish, small, and portable, with a very good remote control. Pipe has no onboard treble/bass settings, so you’ll have to adjust your iPod’s Equalizer if you don’t like the default sound. Audio output is clean and substantial, without any distortion, but maximum volume is not exceptional. Four AAA batteries will turn a Pipe in to a roving groove tube. Four little rubber feet support the round Pipe when it’s stationary. Insufficient iPod inserts are provided: only one each for new nano and shuffle. 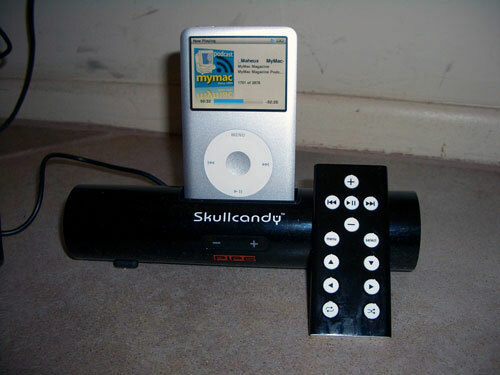 Other iPods must reside on Pipe’s dock connector with limited stability. The company’s web site is strange, and incomplete. Do a web search for “skullcandy pipe” (quotes not necessary) to learn more about this product, but there isn’t a ton you need to know, other than black is probably your best choice in color. MyMac especially likes the stereo separation achieved by having speakers piped out to the round ends of Pipe’s tubular pipe. The sound is spacially pleasant to the ears over long listening periods. Out of a possible perfect score, we deduct one point each for no treble or bass controls and not enough iPod inserts, then add back a half point each for clean, compact styling and handy remote, for a MyMac rating of 4 out of 5. What’s not to love about this new company’s innovative approach to iPod auto FM transmission and multi-cable packaging? GrooveSafari is the best ever basic FM tuner/charger for iPod, with solid signal strength and clear, visible in-car display. The three component pieces are detachable, so the transmitter can be used with or without charging an iPod. No FM transmitter is perfect, but when radio frequencies are available, you’ll agree with our strong 4 out of 5 MyMac rating. GroovePowerPack is even better. In one small box are: USB iPod tabletop AC dock cradle, USB iPod charging cable, USB power brick, USB A/A extension cable, USB 12 volt car adapter, mini-stereo earbud Y-splitter, and mini-stereo RCA splitter. You can charge, dock, connect, split, and listen to an iPod via car, headphones, or stereo wherever and whenever with the contents of this tidy carton. MyMac rating 4.5 out of 5 — where is the double-male mini audio extension cable? MyMac hopes to be able to work through Cygnett’s entire product line, so watch this space for future reviews of their full range of audio and auto goodies. 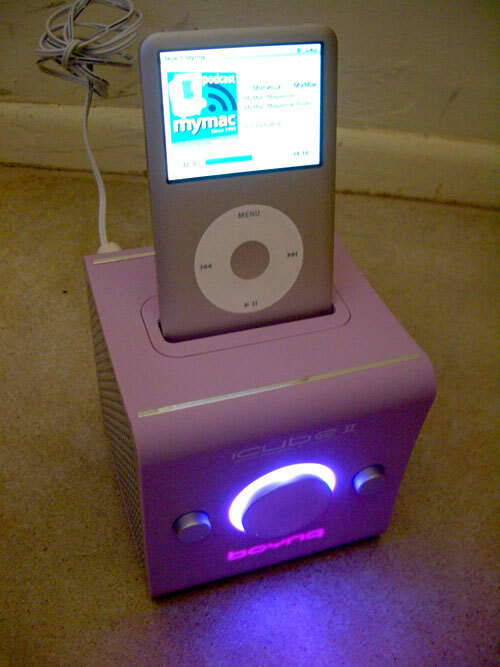 Echoing our recent review of Boynq’s Sabre speaker system, MyMac recommends the bold black model of the iCube over the yucky pink version. iCube II is extremely easy to use, with its full range of six iPod dock inserts, effortless charging/syncing capabilities, and large array of included connector cables. The company web site is still peculiar, especially when trying to read about the “femme” model, with white text on a lavender background. A clever CoverFlow simulation photo gallery is worth a peek, but there is too much self-praising hyperbole on this official web site description. You’ll have more success reading reviews and doing your shopping on sites such as Amazon.com, where their Marketplace has prices as low as $34 for the black “homme” iCube II. At this price, iCube is a steal of a deal. Consider how much you can pay for an iPod charger, and Boynq’s value pricing is stellar. iCube II is a go-anywhere plug-in one piece speaker. Audio spectrum is thin, with very little bass, but midrange and treble sound clarity and volume are very good. MyMac likes the push button on-off-volume illuminated knob, but the little round treble and bass controls are not as handy. Cube II is a cubicle killer, or dorm demon. You’ll hear and see what I mean when you get your little speaker cranked all the way up. Friends, colleagues, and family will love it or hate it, but they won’t be able to ignore it. Jack stores your iBuds with a flair, and a purpose. Five percent of all sales go to the American Hearing Research Foundation. MyMac rating: very clever, and very affordable 4 out of 5, if you’re using your official Apple buds. Tunewear’s clear solid iPod case is almost identical to two other “shields” reviewed here from Agent18 XtremeMac and. Again, if this sort of case is your top priority for protection and visibility, Tunewear has the answer.